Issue 14 is available for download Friday 10th Feb. 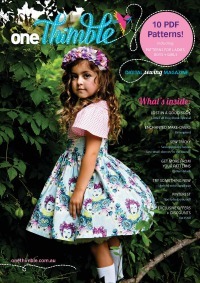 It includes pdf sewing patterns, handmade business articles and many crafting and sewing tips. Everything a crafty Gal needs. Click here to nab a copy for yourself. It doesn't matter who you sew for or what your craft passion is, One Thimble has you covered in issue 14. Not only are the patterns fabulous but it is full of must-read articles for anyone is works in the handmade industry. ​Click on each image below to check out more details about each pattern. You can buy each pattern as a separate download or buy the entire issue by clicking on the picture above.